Which heterocycles should we go after? This is an odd question, isn’t it? The answer largely depends on who’s answering. A natural products chemist will have a vastly different opinion from someone who is more interested in small molecule probes. Some people might even be taken aback by the “should” in this question. Many of us are guided by sheer curiosity, rather than by the inherent value embedded in the function of molecules we make. Still, though, it is fun to make molecules that are both novel and useful. Some really nice strides have been made in employing well-known heterocycles to solve well-recognized problems of modern biology. As an example, please consider the isoxazole core shown below. Drs. Stuart Conway and Paul Brennan of Oxford University have developed several potent inhibitors of the so-called bromodomains, whose main function consists of recognizing (or “reading”) the acetylated lysine side chains off histone proteins. The isoxazole scaffold is a clever mimic of the N-acetyl group found in N-acetyllysine. 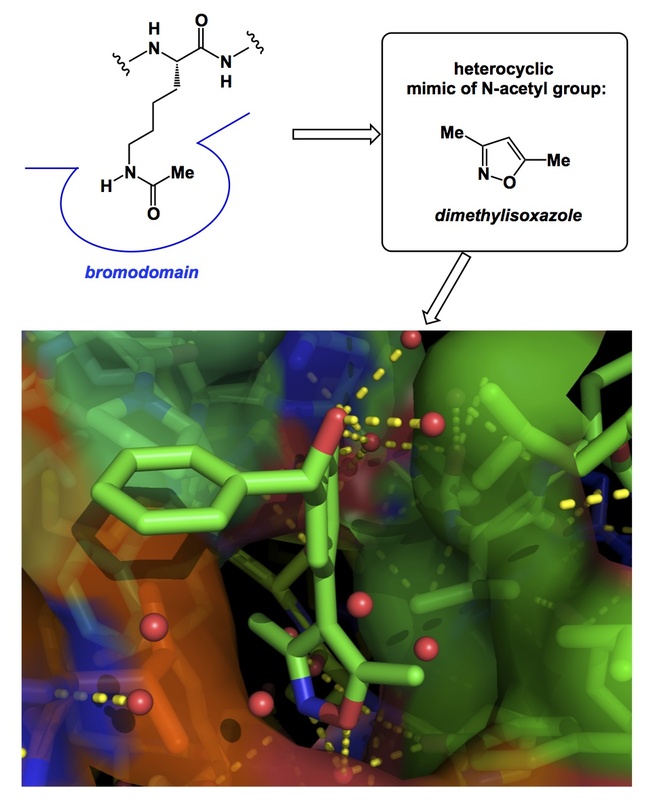 By interacting with the acetyllysine binding site, isoxazole-containing small molecules outcompete natural peptide-based partners of bromodomains, resulting in interesting downstream events. This is because “readers” such as bromodomains are involved in many epigenetic signalling pathways. In the picture above, I am showing a view of the co-crystal structure between BRD4 and its isoxazole-based inhibitor. The structure was solved at SGC-Oxford. The view shows how the isoxazole core interacts with the water framework (red spheres) in the protein structure. I am going to visit Paul in Oxford in about 2 weeks in order to discuss a collaboration that will seek to employ our own molecules in this vein. It will be fun to evaluate something completely new, namely heterocyclic cores that have not been considered before. Back in Russia they say “anything new is a well-forgotten past”. Indeed, some might say that it is not easy to imagine a stable aromatic molecule that has eluded isolation and synthesis. But I disagree… There is ample room for ideas aimed at aromatic scaffolds that have never been contemplated before. Apart from our own efforts, examples that demonstrate a viable approach to this sort of science can be found in a fairly recent report by Pitt and co-workers (see the link below). The title of the paper is outstanding: “Heteroaromatic rings of the future”. There are clearly many new ways of putting together stable aromatic scaffolds that have remained unconquered to this date! I am sure that some of them might be brought to bear on difficult problems of biological probe design.